Most bathroom features, fixtures, and floors usually come in white. This is to make it easy to spot and remove stains. Everyone knows that microscopic germs thrive in bathrooms, but just the appearance of purity can make one ignore that fact. A totally white bathroom can give the impression of cleanliness. So, the strategic placement of your bathroom can be a good way to increase your home value. For example, adding a toilet in your basement can create a contrast: the white of your toilet and the dark abyssal walls of a room underneath the earth. This gives highlight to your toilet amid a backdrop of gloom. Another technique is to place separate bathrooms in each floor. That way, if one has an emergency call from Mom Nature, they won’t have to ascend or descend the stairs while holding it in. Your house is your sanctuary, where you recover and re-energize to face the world anew. But sometimes, little mischievous gremlins in the form of children (yours or your fellow tenants’ spawn) can introduce a bit of anarchy to your paradise. Naturally, you retreat to a safe room, one of which is your bathroom. Everyone understands the need to be left alone when dumping a poo. For one, focus is needed. Second, it’s hard to defecate when you know someone can see you. Third, no one in their right mind wants to watch that chocolate process. Thus, the unwritten universal law to give one their privacy when in a bathroom. Of course, you aren’t necessarily limited to relieving yourself. You can just sit there and just browse the net on your phone. If you want even more relaxation, installing the right bathroom window can give you a nice view of the outside world while obscuring your bare presence. You can watch life pass by while you take a nice rose bubble bath, novel on hand and wine at the ready. Not just for your bowels, but for your soul too. Like in the previous point, you can enjoy total privacy in your bathroom, and like in the last example, you can relax to your heart’s content. A rose bath isn’t just the only way to do that. You can also have a regular hot shower, a one-on-one talk with your reflection, or even just a quiet moment in there. Some people, particularly those who love to be neat, also de-stress by deep cleaning their bathroom. If you think that’s odd, don’t. 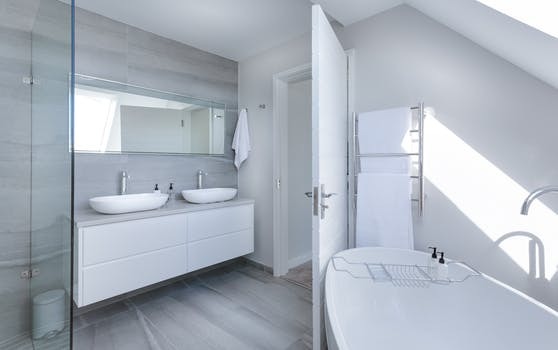 It actually makes sense from a certain perspective: you can immediately see results after a few scrubs on the tiles and fixtures; the grime and stains will be obliterated, and all that remain will be the spotless state of your bathroom. That’s how a fully furnished bathroom, complete with a mirrored medicine cabinet, a bathtub with a shower, and good lighting, can add value to your home. These are just three examples of how valuable a bathroom can be, aside from its necessity, of course. So the next time you want to make improvements to your house, don’t leave your bathroom out of your plans. It may be the only thing that needs a makeover to complete your perfect home.